It's cold outside and the landscape is dreary. And the jolly celebration of Christmas and New Year's is over. I can't think of a better time to make -and share- a pretty cake. My sights have been set on a pink scratch-made maraschino cake, and trying to find a recipe for one has been a little like trying to find Waldo. The same recipe kept popping everywhere I looked. You know, the one that uses a white cake mix as a base? I tried that one, but it was not what I was looking for. I wanted scratch-made. I wanted complete control of what went into my cake, and I wanted it to taste bakery fresh. That doesn't seem like such a tall order, right? Alas. The recipe I had been looking for was in an old fundraiser cookbook (love those!). It took a some mild tweaking, but now it's ready to share! The frosting is the Swiss Meringue Buttercream recipe from my cookbook. I gave it a generous dose of vanilla, which is a nice compliment to the cherry cake. I also want to mention that I made this cake in two 7" springform pans. I cannot tell you how much I love and use this size pan. It makes cakes a little smaller in circumference, but they are slightly taller. I love this profile! You don't have to adjust the ingredient amounts of a double layer cake recipe to accommodate the pans. Just divide the original amount of batter between two (or three) 7" pans and adjust baking times according to the amount of batter in the pan. The original recipe for this maraschino cherry cake indicates the use of one 9" cake pan. As you can see, it divides beautifully between two 7" pans. I may be venturing into the world of video podcasting soon. It all depends on whether or not I can stand the sound of my own voice. I am in major like with my new "special purpose" camera. It's so much fun, and there's something great about capturing the moment with no hope of digital editing, no turning back. I'm completely obsessed with the 90's TV show Northern Exposure, and about to watch the series from beginning to end again. It's not often that I recommend watching television, but this show... it is special. I'm an absolute sucker for Maraschino Cherries and I adore the color of this cake! What a neat burst of color on a dull January day :). I grabbed a couple 7-inch round cake pans at Williams-Sonoma a couple years ago. I didn't have a specific use in mind, but I knew I'd find a use for them someday. I was JUST thinking to myself... I like my 8in pans and I like my 6in pans, but I want to try 7in. I didnt even know they existed... now I have got to find some! Gorgeous cake! Cant wait for your beautiful book! So, so pretty, and I love the Tiffany blue! My favorite hue. And I'm sure it tastes as delicious as it looks. Simply gorgeous! Aqua and pink and cherry! So perfect together. It just makes me smile! Such a pretty cake! Love it! Maraschino cherries are one of my favorites...takes me back to my childhood...I've got to make this soon! I knew I liked you when I started reading your blog. I really like you now that I know you are obsessing over Northern Exposure. Ed Chigliak will always the bomb! So gorgeous!! Wouldn't you know, I made a cherry vanilla cake yesterday (using a mix, of course). Great minds!! I am in LOVE with that heart on top. I've never seen such a beautiful cake! Love the frosting color!! This is so pretty I'm going to cry! That icing rocks my socks! so pretty! love the color contrast (just did barely blue buttercream for cupcakes so i am a little biased! )...is the heart on top edible?? The colors in that cake are just gorgeous! I can see why you like the taller slightly smaller cake layers. Do you have a recommendation for a good spring-form pan? Mine is a disaster! Que maravilloso Layer, la combinacion de colores es elegantisima. Le deseo un feliz dia. Amen and halleluia. I just can't dig cake box mix recipes any longer. There's something gratifying about making a cake from scratch. Thank you for doing all the tweaking to make a childhood favorite cake a possibility in my own home. Book? Is it out yet? I'm waiting to buy it, as I totally admire your skills behind the lens, and your artistic presentation of your beautiful recipes. I can't wait to make this! It looks absolutely delicious. The little camera you posted about is amazing! I might have to buy one. And your cake looks gorgeous, as always. Heather, you did it again, your pictures made me drool all over the place! This cake is stunning! You always make the prettiest cakes, I love coming to this space of yours Heather. Another gorgeous creation. I love cherry vanilla combined. This goes to the top of my to bake liststat! The cake is gorgeous -- simple yet elegant and fun! I'm wondering, where did you buy your 7 x 3 springform pans? Very pretty Heather! Looks so delicious! this is probably the most gorgeous cake i've ever seen. EVER. It's too pretty to eat. Really! great color pairing, that blue and pink are smashing together. What a BEAUTIFUL colored cake!! Love it! I also LOVE Northern Exposure. I used to watch it when it was on TV when I was pregnant with my son (21 years ago!) - I can't even say which one of those quirky people is my favorite... I think they ALL are! Enjoy watching it, Heather! Its the perfect cake to make for a party my son has to attend. LOVE IT! Can't wait to make it! THANKS a MILLION! The cake looks beautiful! I really like the different colors you used, it makes the cake look so pretty, well that and the fact that you have awesome cake skills. 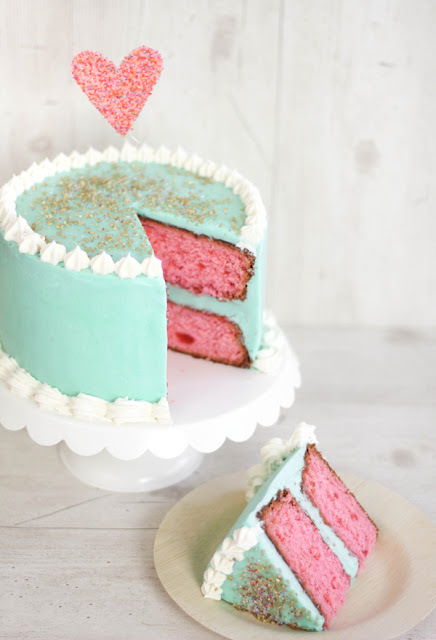 LOVE the color of the cake and frosting let alone that is looks so delish! Found you via Pinterest and so glad I did, thanks for sharing the recipe! The uncut cake is beautiful and the cut cake is stunning with that rich pink colour bursting out. I love receiving your blog in my emails. After reading your post I HAD to run to the store and get cherries. Made the most delicious cake last night and cannot wait to take it over to my neighborhood party tonight. I'll send you pics! THANK YOU for such an inspiring, "have to do this" moment. 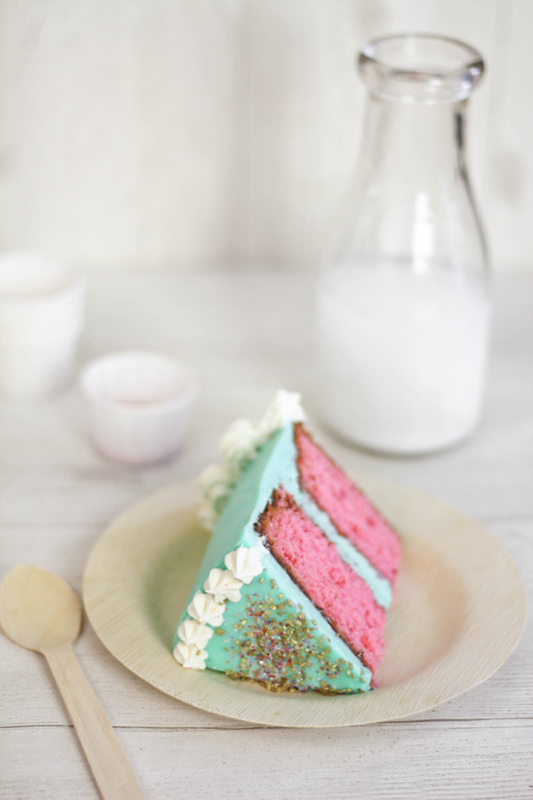 This is so pretty - I love the unusual combination of colours and the flavours sound fab! I don't have a baking tin that small but might have to invest - smaller cakes are so cute. This cake is so gorgeous! Please don't be insulted when I say that I don't even care how it tastes! It is so swoon-worthy...just beautiful! It makes me smile and I thank you! Too gorgeous to eat. I wish I can bake like this. Just too beautiful. my goodness. your blog is so attractive and wonderful and bright and delicious. oh how I love Northern Exposure! I cry every single time, still, at the last episode. I'm so happy to find another fan. Your cake is just lovely. thanks for sharing the recipe. This cake is EXACTLY what I have been looking for to make for my sisters wedding shower! She loves cherry chip cake, so this will put her box cake love behind her. Also, the frosting color is exactly the color scheme I'm using! I can't wait to make this. My husband (sweet-tooth man) will certainly enjoy the trial run haha! Thank you so much for posting this for others! YUMMY! what an adorable cake and it looks delicious too! Hi there! I love your blog! I am a frequent "lurker". I live in Alaska - I noticed that you like Northern Exposure in this post. It made me chuckle since I am here in Alaska. Anyway - thanks for your blog - it provides much inspiration! This cake is amazing. So pretty, and the topper is genius! Um, not to be rude but can I just come over to your house? It was great to meet you last month and I hope we meet again soon (in your kitchen). Just kidding (but not really). Also, I hope all is going well with your book. Will totally help support you when it launches. Heather! You are more than welcome to come over. Fair warning: my kitchen is usually a mess and I have two pugs that will want to sit on your lap. 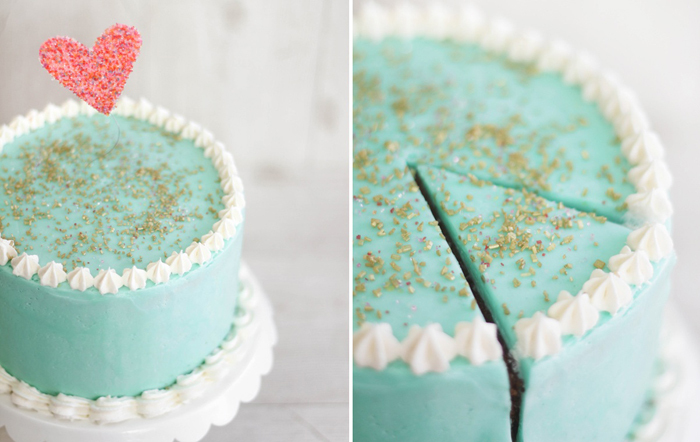 Sometimes, there's nothing more lovely than a cake dressed in a pretty color with a little sparkle. Who says cakes have to be insanely decorated to be gorgeous? This cake proves that wrong! I adore it!! Plus, it sounds ridiculously delicious. Oh lawdy.. I attempted to make this cake yesterday.. It was a disaster :(. Let them cool just to see if maybe the inside had escaped the the exteriors fate, and I wanted to torte the cake and fill it with chocolate ganache as a maraschino cherry interpretation... No pink to be found, it was the color of bit o' honey..
Perhaps and I still hAd 12 minutes left on the timer if I'd left them in! My oven must be one hot beast.. But otherwise, I will attempt this recipe again and check that guy before it shrinks up into something that is only fit to be crumbed up and fed to ducks..
And woah... My IPhone just totally made half of that grammatically insane with predictive text. That'll teach me not to proof read. Oh my goodness, I am drooling just looking at this! Thanks for sharing this delicious recipe. The photography is amazing, loving your work! I featured this recipe pon my blog, in my Five Fabulous Fings on Friday post. My mom made this cake for my birthday, it was impossibly pretty and delicious! What a treat! Can these be made into cupcakes? Would I need to alter anything? I would also like to know if this recipe would transition well to cupcakes? And also what type of sprinkles did you use? This cake is just absolutely delightful! Loved this delicious recipe! I got 12 cupcakes out of the batter. Such a beautiful pink color and so tasty with the maraschino juice! I did not have to use additional red drops of coloring. I also poured vanilla cherry almond glaze over the cupcakes instead of making icing. Baked at the same 340 degree temperature. I checked for doneness around 25 minutes but did end up baking longer. When it was light golden the cupcake was too tender and fell apart. When the top was caramel brown color like seen in the above pics, it was done. Still moist but did not fall apart. Thank you so much for sharing this recipe! I look forward to trying more of your recipes! And congrats on your book! I made this cake and it was a hit! The cake itself was so incredibly moist and flavorful. I tried to replicate the color you made for the icing, and let's just say I had a heavy hand when putting in the food coloring. It turned out a hideous shade of teal-ish green! But it was delicious all the same. Thanks for the recipe! I'm in love with the colors of this cake! I also love almond with cherries, and will definitely be trying out this recipe. Reminds me of an elegant, and maybe slightly whimsical, tea party. Made these into delicious cupcakes! I got the batter to easily yield 24 and cooked til firm but not brown. About 20 minutes cook time @340 degrees and then just continually checked til done. I epic failed when making the frosting but I do not have a stand mixer and I think somewhere I messed up because it turned out looking like watery cottage cheese and tasted like butter. I ended up subbing a cream cheese frosting and it was amazingggg. One of my goals for this year was to find a great homemade cherry chip cake. Could my search be over on the first try? How awesome would that be. I'll let you know how it goes. This cake is seriously beautiful!!! I'm in LOVE. Love this! I made cupcakes last night, yielded exactly 12. Next time I will try the double layer cake; great excuse to buy some new pans :) Curious though because I had the same issue as someone else with the frosting -- turned out the consistency of cottage cheese and tasted of nothing but butter. Ended up using a standard vanilla buttercream frosting which was great, but would love to know what I did wrong! This cake is gorgeous and sounds delicious! I featured it today on a dessert collection! IS there a trick to the frosting? When I make it it looks watery with curds. Sounds like you're not beating it long enough. You can also try adding the butter while it's still a little cold and the frosting may come together faster. Try using the butter just softened instead of room temp. Do you think I would need to modify the recipe to use 6 inch pans? Hope not! Turned out great, except my frosting curdled as well. I just continued to beat it and it eventually did become smoooth, but like other said it tasted like pure butter--so I added about 1 1/2 cups powdered sugar. MUCH BETTER! What are the sugars sprinkled on the top of cake??? Love it! When you added powdered sugar did it have a granular texture? Anonymous- no, powdered sugar kept it smooth. If you add regular sugar it would be very crunchy/grainy. Powdered sugar is the best option. I always make my mom's birthday cake every year, and she'll love this! Just wondering, though...what did you sprinkle over the top of the cake? I didn't see it mentioned in the recipe. It looks kind of like raw sugar. Thanks! I made this and the cake was great! My only question is with the icing... I followed the directions and it just tasted like creamy butter. The flavor was just ok to me. Did i do something wrong? The only thing that didnt' happen like the recipe states is that after I wisked the eggwhites, sugar and salt over boiling water until hot and sugar dissolved, The whisk attachment never got the mixture to "stiff peaks" and i ran the mixer for a long time. It did become fluffy, kinda like marshmallow fluff but never stiff peaks.... mmmm..... wonder what happened? I am going to have to try you cake now too! This is so beautiful, I am for sure going to make this for my little sister's eleventh birthday! She is going to love it. you are an Amazing chef!!! just the sight of that cake made my jaw DROP.. literally!! im going to make this cake for my friend on her bday before she leaves for college.. i dont think she'll be able to forget this cake for a long time.. or maybe even FOREVER!! I think your post has been stolen. Same as everyone else- the cake turned out great but the frosting was gross! I beat it to death and the consistency never changed. There aren't any steps or ingredients missing? There are no steps missing, and there have been folks to have the entire cake turn out great (see this link http://www.facebook.com/photo.php?fbid=10100205978045206&set=o.128793013817454&type=3&theater ) Really hard to say what happened - were you using a stand mixer? It looks so pretty and I am making the cake right now for my daughter's birthday. Quick question- I am using two 9 inch cake pans. Should I bake at 350 instead of 340 degrees? Love the look of the smaller cake - I will try to find 7 inch pans for next time. I also LOVE Northern Exposure! Sorry I'm late with my reply! I'm sure your cakes are already done! But to answer, the cake can be baked at 350, just reduce to baking time. Check it at around 40 minutes. Thank you! The batter smeels so good I cn hardly wait to tast the finished cake! Thanks for getting back to me so soon. I saw this on Pinterest and am making it for my daughter's 2nd b-day on Saturday. LOVE the colors!!!! I am absolutely in love with the color of this cake! I want to make it and then paint my kitchen and my nails to match! And a cherry cake.....yumm! I made this as cupcakes for my daughter's birthday (with a whipped cream cheese vanilla frosting). They were great! I recently made strawberry cupcakes that were nasty! At my DH's suggestion, I am making strawberry cupcakes again, using this recipe! I diced several strawberries, sprinkled enough sugar to make the "juice" to replace the cherry juice, and they are in the oven now! They look and smell SO much better than my last strawberry cupcakes! the colors in this cake had me at hello! Just made this as cupcakes for my Grandma's 95th birthday party. I thought the cake & frosting were absolutely amazing! I got 17 cupcakes, but they were a bit on the small size. Everyone liked them, but said they were very dense. Definitely have my eye on some 7" pans now thanks to this post! Made this yesterday! It was amazing! I used the Wilton buttercream icing instead, everything was amazing!! Have you ever tried using the canned cherries? The deeper more tart ones? Hi, I dont have a stand mixer. I would love to make this for my husbands birthday tomorrow. Can you make it with a hand mixer? Here's a video tutorial on making the frosting if you ever decide to try again. A delicious cake! I replaced 1 cup of flour with ground almond meal - it was so moist. Only set back was that I made the frosting the day before and refrigerated it. I thought I could beat it back to a soft consistency to ice the cake, instead it ended up a congealed and watery mess. One question - the narrative says that you gave it a generous dose of vanilla, but the recipe calls for almond extract. Which one did you use? I just made this for my Daughters birthday cake. An I must say it smells amazing, and the icing had to be put to the side or I would eat the entire bowl!!!! I am already planning on making it again!! I am making it extra red on the inside and light yellow for the frosting with white piping. It is a 2 yr old's Vintage Minnie Mouse party....Cannot wait to be able to eat it!! This is baking in the oven right now! It is lucky it made it there, the batter was sinful! I love how the cake not only looks yummy but it also is also comesticly very pretty. Just made these into cupcakes! I started checking if they were done after 20 minutes. I almost doubled the cherries in the recipe. (I say doubled because I had to eat a few first!) I think next time I will try baking a little cheesecake into the middle for a maraschino cherry cheesecake cupcake! I got spring-form pans as a wedding gift 7 years ago that I have never used. I think I might have to break them out to attempt this beautiful cake!!! Found your blog on pinterest and decided to make this cake last night. It was phenomenal. Wow. Thank you for sharing. I can't find sprinkles as pretty for the heart topper....Any idea of the brand? I made the frosting the day before, do I refrigerate it? It looks like someone else had issues with that but I wanted to ask the question directly. 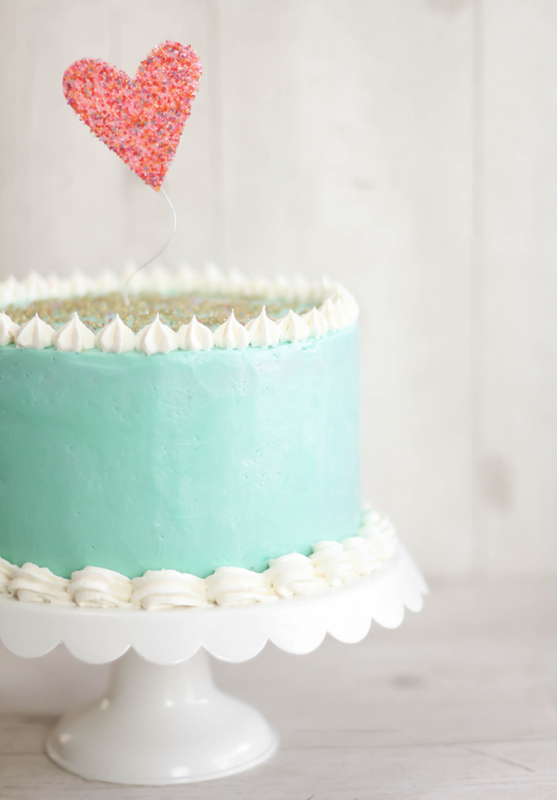 I'm not a maraschino cherry fan, but kept coming back to your post, because your cake is so darn pretty! I wanted to make something special for Easter, and decided it was time to make this cake. It was delicious! Thank you so much for sharing this recipe. It has instantly become a special celebration favorite! I think it may be the coloring you're using. The gel coloring gives it a bright pink hue. The cherries just add little flecks of red. What kind of coloring are you using? Thanks yes its pink gel colour from waitrose (UK) I think I will try and make the sponge 'whiter' by omitting egg yolks & using different butter. Flora is very yellow...! I've gotta keep trying - my daughter has seen it n wants it for her birthday! OHMYGOSH!!! I just finished frosting this cake and am having a slice now. It is the most amazing cake I've ever made or eaten! The texture is spot on and the SMB complements the cake perfectly! I tested this recipe now since my mom's 70th is this July and her favorite ice cream flavor is cherry vanilla. I think this will be a great cake for her birthday! Have you ever baked this in larger sized pans?m I used two 8" pans, but was thinking maybe three 9" pans would be the perfect size. I will have to try this soon, it is just a beautiful cake...By the way do you happen to have a strawberry recipe..we are all so sick of adding jello or artificial flavorings to get that good strawberry flavor and have it look nice too.. thanks and your photos are great! I don't have a strawberry recipe yet. I should do that next! Great recipe! I made it for a fundraiser cake walk, and made it the same gorgeous blue-green & white, except tiered with an 8-inch and 6-inch. The icing looked like cottage cheese for a while when beating in the butter, but then I turned the speed back down to medium low and stopped being so impatient and it smoothed out beautifully. I only wish that glorious shine of the egg whites and sugar could remain intact in the finished icing--it was practically iridescent. And the scraps I was able to eat myself were fantastic. Any suggestions for high altitude adjustments? This cake is soooo good.. I have a friend requesting a dairy free(all dairy soya whey free) version if this cake could you please help me out with a dairy free option..I want to keep the fantastic quality of this cake. I made this cake yesterday for my MIL's birthday. It was so good! It received lots of compliments. I used a buttercream frosting with vanilla and maple flavoring. Hi! My buttercream frosting just broke! It looks like soup. I didn't wait long enough for the egg whites to cool down. :/ I have it in the refrigerator now. Is there anything else I should do? Thank you! I made this cake for Valentine's Day in 2012 - And It was DELISH! My kids loved this cake, My husband loved this cake - I love this cake - The colors and flavor...YUM! Hi..this cake is beautiful! Could you tell me whether this buttercream will melt if it stays out of the fridge for a couple of hours? I want to make it for a bake sale and am not sure if the buttercream will be stiff enough even for transportation. Thanks in advance!! So I don't normally comment on recipe pages, but I have to for this one. I've made this cake three times now in the past year, and it is absolutely perfect. I love bringing it into the office - there is a guy in my department who hates just about every berry type cake except this one. He will eat two huge pieces and bring home some for later he loves it that much. While I've never made the frosting recipe here, I've just used vanilla buttercream and have decorated it in various ways, and it tastes great. I also use two 6-inch cake pans (lined with parchment paper on the bottom and sprayed decently with nonstick spray), and it makes a tall, super cute, pink cake. I love this recipe, and it's so different it catches people off guard and introduces them to a new thing, a new flavor, a new experience. Best. Comment. Ever! Thanks for the feedback Erin. I make this with regular buttercream sometimes too. So glad to hear this one is a keeper for you. This icing was really far too buttery. It was as though we just slathered a pound of butter on top of this cake. It really ruined my son's birthday cake and no one -- not in the 8 people present liked the icing. Taste is a matter of choice, but we prefer something really light and fluffy. We'll stick with Wilton icing. Thanks for sharing your opinion. This is good information for others who have never made Swiss meringue buttercream. They may want to make a test batch to make sure they like it, before covering an entire cake with it. Heather- about to try this cake for a friend's birthday, but I have 2 questions- 1) if I'd like to make a 9" version, will a recipe and a half work? Also, can morello cherries be used instead of maraschino?? Hi Heather! Mascarpone cupcake gal here!! :-). I have been looking for a great cherry vanilla recipe and, of course, went to your site first. This cake is lovely. I read all the comments, and am considering buying 7" pans. I have a ton of 6" and 8", but I do like taller cakes. Do you think the 7" is a great difference between the two that I already have? As I like taller cakes, are you able to let me know about how tall a 2 layer 7" would be? Maybe how many cups of batter the recipe makes? Thank you! Hi again, Paula! I think this batter would perform beautifully in 6-inch pans. I make this cake about once a year, and I've never measured the batter! I think you might be able to get three 6-inch layers with this cake, which would give the cake a little more height. I'm not exactly sure how tall the 7-inch double layer cake is, but it is petite. I wouldn't call the finished cake 'tall'. It's probably around 5 or 6 inches tall frosted. These are great questions and I'll be sure to note the size and batter quantity next time I prepare it! I'm not sure if I've helped much, Paula, but thanks for your questions!